An annual GPS Cricket Premiership has been held since 1919. These days over 3000 cricketers in 280 teams compete in Year levels and divisions in a nine round home and away season. The GPS is a proud partner with Queensland Cricket. GPS uses the MyCricket App to provide quick and easy access to all season fixtures, scorecards and ladders. Download the MyCricket App on iPhone or Android to stay in touch with the information that matters to you. The Earle Williams Trophy is named after a man who made his first appearance on the GPS scene as a member of the Ipswich Grammar School’s First XI which won the Premiership in 1937 – the school’s second success. After some years without a trophy following the loss of the original, a meeting of the GPS Sportsmasters’ (now called the GPS Sports and Activities Committee), held in the 1980’s, decided to provide a new trophy. Earle Williams was proposed as representing a person who had made the greatest impact on GPS Cricket as a player and a coach. The proposal was unanimously adopted and the trophy was presented to The Southport School in 1982 personally by the honoured nominee. With characteristic modesty, this event passed unnoticed, even to his sons. As a player, Earle Williams has by far the most imposing record of any IGS cricketer. A member of the First XI for five years (1937-1941) and Captain in 1940 and 1941, he scored five centuries including a double century. His 217 not out in 1941 is recorded in the school’s Centenary History of the School. He was selected in the GPS Combined XI’s in 1940 and 1941 and in the latter year was Captain of the side. There is no doubt that World War II in which he served in the RAAF from 1942 curtailed a promising cricketing career. After the war he trained as a teacher and spent several years in the state education system before returning to Ipswich Grammar School in 1957, assisting Alan Ware with coaching of the First XI to a Premiership win that year. His astute advice had gained the respect of the team, and when he took over as coach the next year, the returning members provided a solid basis for him to guide the 1958 team to another Premiership. 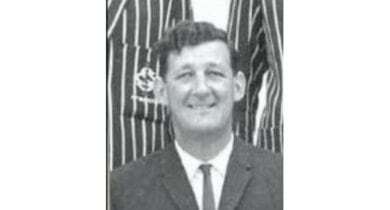 He was to wait until 1968 for another Premiership win and with the team composed of mainly Year 11 students, was again able to coach them to a win in 1969. Further success ensued in 1975. In between there were many memorable years of experiences of which Earle and the team members had vivid memories – his approach to coaching was psychological as well as technical. He strived to mould a team which could handle all circumstances and conditions. The Premiership for the Champion School is awarded to the First XI team only, and is based on an accumulation of competition points over the season. Download the iTunes MyCricket App today. Download the Android MyCricket App today. View the rich history of GPS Cricket 1st XI Premiers in the Trophy Room.